Italy has threatened to allow refugees to cross its borders into neighbouring countries unless the European Union takes charge of a sea operation to manage the flow of migrants crossing in boats from North Africa. Interior Minister Angelino Alfano yesterday demanded more help after the Italian navy task force Mare Nostrum rescued more than 200 migrants and recovered 17 bodies when the boat carrying them sank off the Libyan coast. “The European Union has two options: either it comes to the Mediterranean to put the EU flag on Mare Nostrum or we will let migrants with right of asylum leave for other countries,” Alfano wrote on messaging site Twitter. Italian politicians have long demanded more help from the rest of the European Union to deal with the crisis, which disproportionately affects the bloc’s southernmost countries, including Malta. They have called for a change to rules which oblige asylum seekers to remain in the country in which they first arrive. Many migrants hope to travel onwards into northern European countries with stronger econo­mies than Italy, which has grown little in a decade and where unemployment is near 40-year highs. At least 34,800 people have made the treacherous crossing from North Africa to Europe so far this year, compared to 43,000 in all of 2013. This puts the annual total on track to surpass the 60,000 who made the trip in 2011 when the Arab Spring revolutions loosened border controls, according to the UN refugee agency UNHCR. Hundreds of people have died after their flimsy and overcrowded boats sank on the route. After the latest shipwreck on Monday, Italian naval and coast guard ships recovered 17 bodies including those of two small children and rescued 206 survivors after the 12-metre long wooden boat they were packed into sank some 45 miles from the Libyan coast. The incident, which occurred outside the zone normally patrolled by Italian vessels, followed a similar disaster off the Libyan coast on Sunday in which at least 40 people drowned. “This was the second shipwreck in a week,” Admiral Mario Culcasi, commander of the Mare Nostrum task force set up to deal with the crisis,said. “They are a symptom perhaps of the difficulties that the smugglers are facing, above all in finding seaworthy boats,” he said. 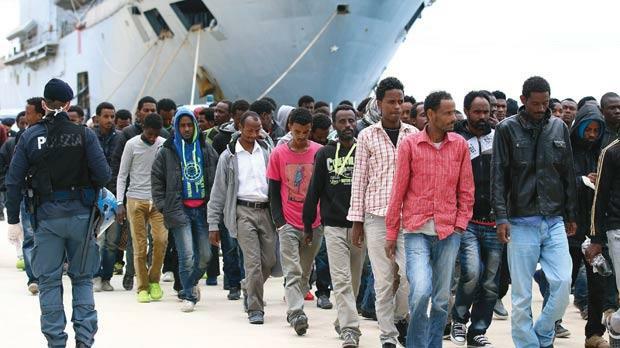 The most common migrants are Eritreans fleeing hardship and army conscription and Syrians escaping a civil war that has dragged on for three years. The UNHCR said it was not clear why the numbers of migrants crossing had increased this year compared to 2013. But Egypt has become less welcoming to Syrian refugees and European efforts to stem the tide of West African migrants via Morocco may have diverted some to Libya. Sophisticated marketing by people smugglers and encouragement from friends and family who successfully mad­­­e the crossing could also play a role, said Chris Lom, spokesman for the International Organization for Migration, warning that the numbers perishing on the journey were likely to increase.